Quantity Estimation involves a lot of cumbersome calculations using various formulae. The use of calculators and Spreadsheets (like MS-Excel) for Quantity Estimation is a widely accepted practice. These methods require a lot of back breaking tedious work involving Linking of cells in Spreadsheet. It is now possible to reduce all these hassles by using the FORMULATOR, revolutionary new Quantity Estimation software developed by ENSOFT. The scope of the FORMULATOR is not just restricted to Civil Engineering Projects but it also extends into other avenues such as Mechanical, Chemical and even Electrical Engineering Projects. In FORMULATOR the Project is defined in terms of its Objects. These Objects may be located at different locations in different numbers. Project working drawings can have multiple objects. Object involves different Items of Work such as Concrete, Brickwork, and Plaster etc. These Items of Work involves materials, machinery, Labours, Overheads and taxes (which is part of Rate Analysis), that make up an Object. Each of these Items of Work has to be quantified individually using formulae. FORMULATOR uses a new approach in entering Formulae for calculating quantities of various Items of work for an object. These Formulae are completely USER DEFINED in terms of the variables used in them. These variables can be used in any other formula of the same object. Variables common to different objects can be defined as Common Variables. This offers flexibility and simplicity in defining long and complex formulae used to calculate quantities. The Objects that are defined becomes a part of the Library, which is available to the user for Future Projects involving similar Objects and Items of Work. FORMULATOR comes with it’s own Library of standard objects common to multiple projects. In addition to the standard Library the Objects can be imported from the same Project or from another Project. Multiple users working on multiple Projects can exponentially increase the number of objects available to the user in the Library. This increases the speed and efficiency with which the user can complete the enormous task of Quantity Surveying. The FORMULATOR package is very user friendly and requires minimal amount of training for a new user. This saves time taken to train existing and newly recruited Quantity Surveyors. The FORMULATOR avoids the monotonous and repetitive calculations, as the user has to define an object only once. This saves the time required in tedious manual calculations with a calculator. This also benefits in terms of the work being done meticulously and with no errors. The element of Human Error is completely eliminated and yet a complete hands on control is offered to the user at every stage. The FORMULATOR is especially useful when the quantum of work is large and of a repetitive nature. 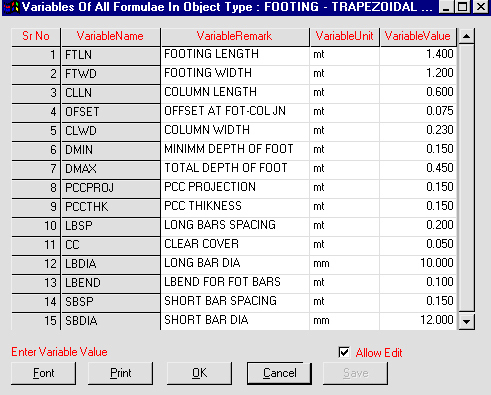 Consider a Trapezoidal Footing as an example. To Quantify a Trapezoidal Footing one needs to estimate Concrete Quantity, Formwork Quantity and Reinforcement Quantity. Each of these Quantities can be calculated using one or more formulae. To work out the concrete quantity of the footing a number of equations can be formed with user defined variables such as FTLN (Footing Length) and FTWD (Footing Width). Further more the preliminary values calculated for intermediate variable such as A1 (Bottom Area) and A2 (Top Area) can be used in another formulae. Similarly other quantities can be worked out by forming equations using the same variables or common variables. A host of standard functions are available in the software, for e.g. a standard function to calculate bar weight/mt using the bar diameter is available. These functions make it possible to calculate quantities without the need for the user to remember constants or even refer to handbooks. Mathematical functions are also provided to make the formation of complex formulae possible. On defining the Equations for calculating various quantities the software prompts for variable values. These variable values are substituted in the formulae and the quantities are worked out. Once the object Trapezoidal Footing is created, it becomes a part of the user’s library of objects. All other users can share this object; modify this object as per their requirement. All future projects where a similar object is used can make use of this object. When the object Trapezoidal Footing is used again anywhere the software would only prompt for the variable values. This saves the time required to quantify the object again as one has to only enter variable values. All the user has to do is maintain a systematic classification of all the objects in use.